The New York Giants won the Super Bowl XLVI with a score of 21–17. 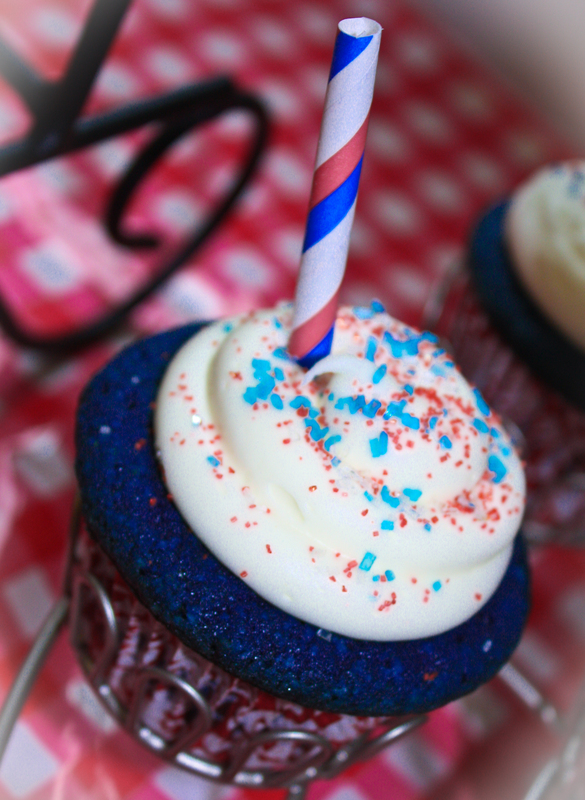 To celebrate the Giants Super Bowl victory, Blue Velvet Giants Superbowl Cupcakes! Preheat oven to 325ºF. Mix cake mix, cocoa powder, eggs, oil and buttermilk together, starting with 30 seconds on low speed, then increasing to medium speed for 1 minute. Add in food coloring and beat for 1 minute more until totally blue and combined. Pour into 2 muffin tins lined with baking cups. Fill about 2/3 full. Bake for 16 – 18 minutes or until a toothpick comes out clean. Let cool. To make the frosting, beat the vegan butter. Add in sugar, 1 cup at a time, thinning out with milk as necessary. Beat in vanilla. 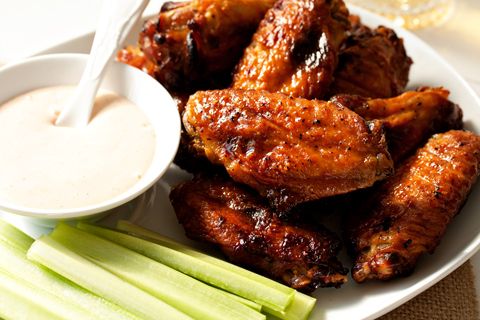 At your Super Bowl Party, you may have some guests who aren’t fans of buffalo wings (why? who knows but they are out there). 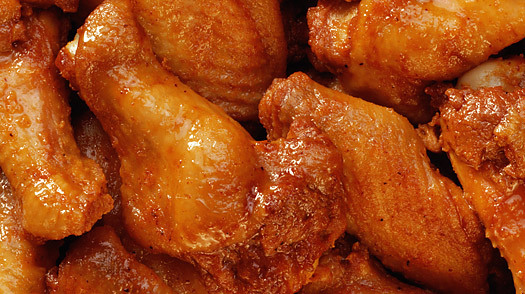 Why not tantalize their tastebuds with some Sweet and Spicy Baked Chicken Wings! Preheat oven to 350ºF. Line a large broiler pan with foil and place a metal rack on top of the foil. Spray foil with nonstick cooking spray. Arrange wings on pan and season with pepper. Place wings in oven and set timer for 15 minutes. When the timer goes off, remove the wings from the oven and brush the wings with ½ cup honey. Be sure to glaze both side of the wings, using metal tongs to turn. Place wings back into the oven, set the timer for 30 minutes, and prepare the sauce. In a medium bowl, combine melted vegan butter, remaining 1/2 cup of honey, Frank’s Red Hot, Sriracha, cayenne, and garlic powder; whisk to combine. While the wings are baking, periodically baste both sides of the wings with the sauce (about every ten minutes). Once the timer goes off, turn up the heat up to 400º F and bake for an additional 15 minutes. 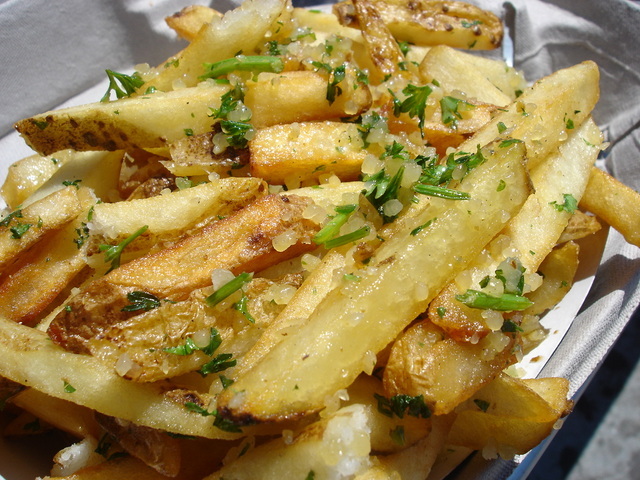 Serve with your favorite Super Bowl sides like some baked french fries! Preheat oven to 440° F. Line a baking sheet with foil and set aside. Combine the garlic and oil in a large bowl (that has a lid) , warming it until the garlic is fragrant, about 1 minute. Transfer 5 tablespoons of the oil (leaving the garlic in the bowl) to the baking dish, coating it well. Add the potatoes to the bowl with the garlic mixture and toss to coat. Close the bowl tightly with the lid and microwave on high until the potatoes are translucent around the edges, 3 to 6 minutes, shaking the bowl to redistribute the potatoes halfway through cooking. Arrange the potatoes in a single layer on the baking sheet and bake, turning once, until deep golden brown and crisp, 30 to 40 minutes. Serve with ketchup, or mayo or your favorite dipping sauce. The countdown to game time has started. Puppy Bowl starts at 3:00pm ET and the main event SUPER BOWL XLVI begins at 6:30pm ET. So, ARE YOU READY FOR SOME FOOTBALL?!?! I know I am! Looking for a delicious Super Bowl XLVI cocktail? How about Game Day Margaritas? 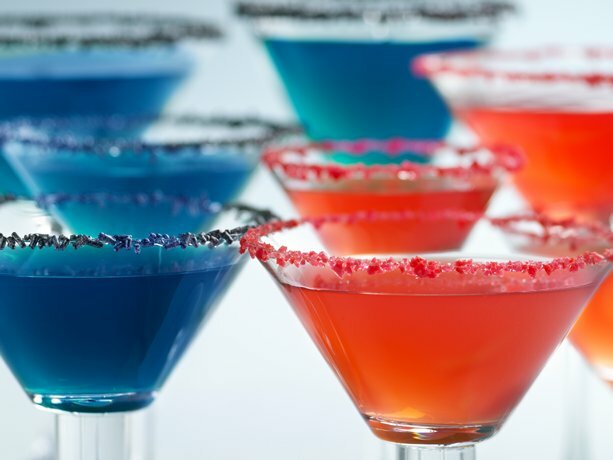 Tinted with your teams colors, these drinks are perfect for game day! To make simple syrup, mix sugar and water in 1-quart saucepan. Heat to boiling over medium-high heat, stirring until sugar is dissolved. Remove from heat and set aside to cool, about 1 hour. Pour syrup into glass jar, cover jar and refrigerate until needed. Makes 1 1/4 cups (use 1 tablespoon per margarita). To prepare cocktail, add cranberry juice, tequila, orange-flavored liqueur, simple syrup and lemon juice to cocktail shaker filled with ice. Cover and shake. Rub rim of martini glass with lemon wedge; dip in sugar. Strain cocktail into glass. Repeat for the blue cocktail, using blue Curacao instead of the orange-flavored liqueur. Tomorrow is the big day. Sunday. Super Bowl XLVI. No matter who you’re cheering for (The Giants) you definitely are going to need some game day goodies!! Whether you go with the traditional buffalo chicken wings or classic chips and dip, your grub has got to be gluten free/dairy free. 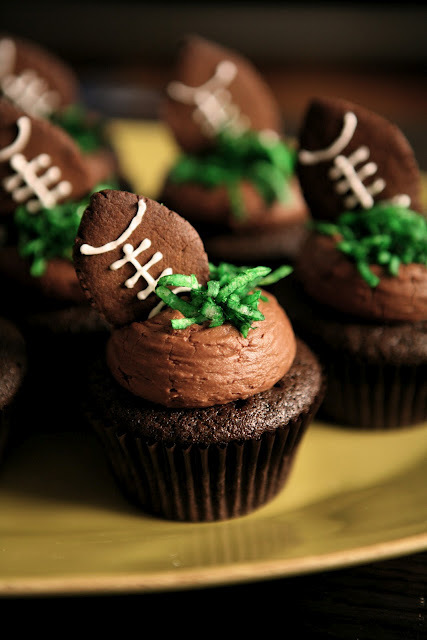 So whether you’re hosting a super bowl bash or attending one, here are a few recipes! Ok I admit I am a Jets fan BUT of course I will be cheering for The Giants on Sunday. I AM a New Yorker! GO GIANTS! I love my wings spicy. When I go to Buffalo Wild Wings and get their traditional wings, I always get a side of hot sauce. Make your wings as spicy as you like. Yes you can make wings without any kind of breading! And they are delicious! Combine the hot sauce, vegan butter, peppers and salt in a bowl or pan with a tight fitting lid, set aside. Carefully submerse the wings in the hot oil, stir them around so they don’t stick to the sides, or to to each other. Put the wings into the bowl with the hot sauce ingredients. Seal the top tightly, and shake well. Serve hot with celery, and carrots. 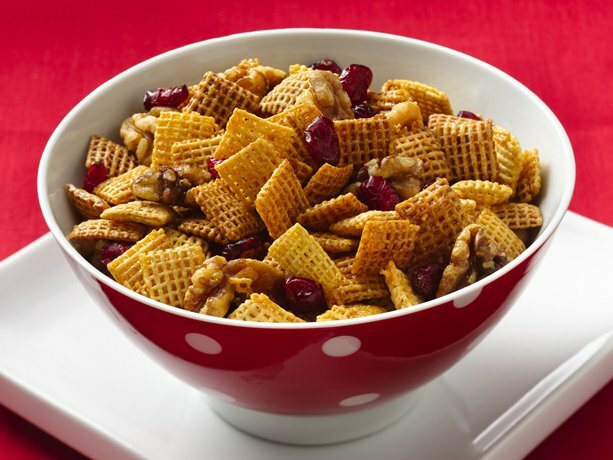 How about a crunchy snack to gobble up during halftime and all those nail bitter moments? In large microwavable bowl, mix cereal and almonds. In 2-cup microwavable measuring cup, microwave vegan butter, brown sugar, corn syrup and cinnamon uncovered on High about 2 minutes, stirring after 1 minute, until mixture is boiling; stir. Pour over cereal mixture, stirring until evenly coated. Microwave uncovered on High 3 minutes, stirring and scraping bowl after every minute. Stir in apples; microwave uncovered on High about 2 minutes or until apples just begin to brown on edges. Spread on waxed paper or foil to cool, about 5 minutes. Place in serving bowl; stir in raisins. If there are any leftovers, store in an air tight container to enjoy later. These recipes are sure to get your game day off to the right start!